I ran short of water with a few miles left in my hike because I decided not to take the 0.2 mile side trip to the spring near Compton Gap when I was a little over 5 miles from the end of my hike. There is plenty of advice related to water out there. The best advice is to not pass up the chance to top off your supply. Getting dehydrated is not good. Another lesson learned is that I should carry something that I can use as a filter for my water bottles when attempting to fill them. Although I use Aquamira drops to make the water safe for drinking the chemicals don’t remove “floaties” from the water. I am still new to the world of hammock camping so each time I hang my hammock from a tree and climb in is a learning experience. Setting out for the AT I knew that my first night on the trail the temperature was supposed to dip down into the low 50’s and that I would be cold. I figured that wearing (and carrying in my pack) a pair of heavy fleece pants and a fleece jacket would be good enough inside my 55 degree sleeping back to keep me warm. I was wrong. Although I was never in any real danger I did end up spending much of the evening curled up in the fetal position trying to stay warm. Why was I cold in my hammock? First off, I set up my hammock on the windward side of the mountain instead of the lee side (generally not wise) and the wind was blowing pretty good all night long. Second, I ignored the advice to use a pad and/or under quilt with my hammock for insulation. When the air temperature is 20 degrees warmer you can do without the extra insulation. When its 50 degrees going without is asking for a long, cold night. If I had stayed with the original plan to sleep out two nights I would have used the stove to cook some Ramen noodles and I might have also brewed coffee in the morning. It is also possible that I would have consumed more of the other food items during the course of the trip. The real issue wasn’t so much that I was carrying too much (although I still have some experience to gain in planning) it was that my trip plan changed mid-trip. On the first day of my hike I got cocky and pretty much threw my trip plan out the window. I planned to make my North Bound 27.4 hike in three days but when my average MPH was much higher on day one then I had expected it would I started thinking that the hike was going to be easier than I had thought… so instead of walking 9 or 10 miles on day one I did 13. On day two I did around 15 miles and was in a lot of pain during the course of the day. Technology is great but not something you should rely on when you are hiking in the wilderness (shocking I know). I brought my iPhone and a battery pack to charge it with and found that reception was basically non-existent for 90%+ of the 27.4 miles of my route. For the most part this was ok. I didn’t really wish to receive phone calls or emails when I was hiking. I had hoped however to post a few updates a day along the route to keep family in the loop with my progress and that turned out not to be possible. On day one I managed to get one update via Facebook at mile 5.8 into the hike. After that I couldn’t get strong enough reception until I was more than 22 miles into my hike and approaching Front Royal again. On the plus side I was able to put my iPhone into plane mode and keep using it as a camera and take advantage of a pre-loaded map of the AT through Shenandoah National Park during the hike. I have a GoLite Jam 70L Pack (as well as the 35L version) and this was my first real long distance hike with it. Overall the pack performed well but there were a few minor things that caused me problems. First, I think that I should have gotten my pack in medium instead of large. I struggled along the way to keep the pack sitting properly on my hips and bearing the load. All this and I had the straps cinched down most of the way. Second, the cinch straps on the side of the pack can interfere with getting your water bottles in and out of the side pockets. Overall these were minor issues that I think I can resolve with a bit more experience. I survived the hike, yay! One of the most valuable lessons I learned from this hike was just that I could do it. I was a little nervous about attempting my first big hike on the AT and completing it goes a long way towards giving me the confidence to do it again. Other than that everything all of the issues I ran into were very minor and surmountable with more practice and miles on the trail. 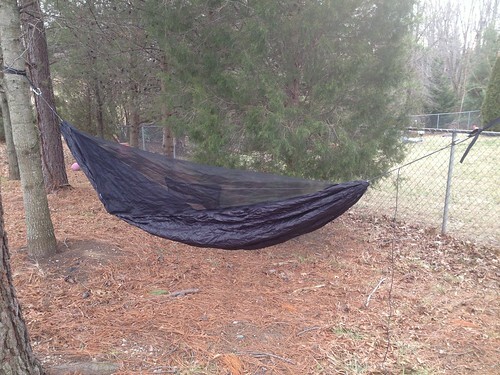 Yesterday I received my brand new Northwoods Hammock Co.’s Wolf Hammock in the mail. I am completely new to the world of hammock camping so I find the Wolf Hammock (seen below hanging in our back yard this afternoon) to be amazing. The whole package weighs in at a super light 20.9 ounces (hammock, integrated bug net, whoopie slings, tree straps, ridge line organizer, and stuff sack). I added 2.6 ounces to the package by using two Black Diamond Neutrino carabiners to hook the whoopie slings to the tree straps (since I am not a master of the art of tying knots). Totaled up that is 23.5 ounces (or just a hair under 1.5 pounds) for a super comfy shelter that packs down into a space of roughly 5 by 8 inches with almost zero effort. Next step in my preparation for hitting the trails this year is rigging up my new tarp for protection from the elements.